Here’s Jenny Q principal of New Village Girls Academy with two students and the objects of their affection from their exhibitions. I stopped by on Wednesday where these students shared their stories through those objects. For Simone Achucaro, it was the art and craft work she created of a character she designed and the accompanying story she animated. The character had loads of personality and personal meaning. 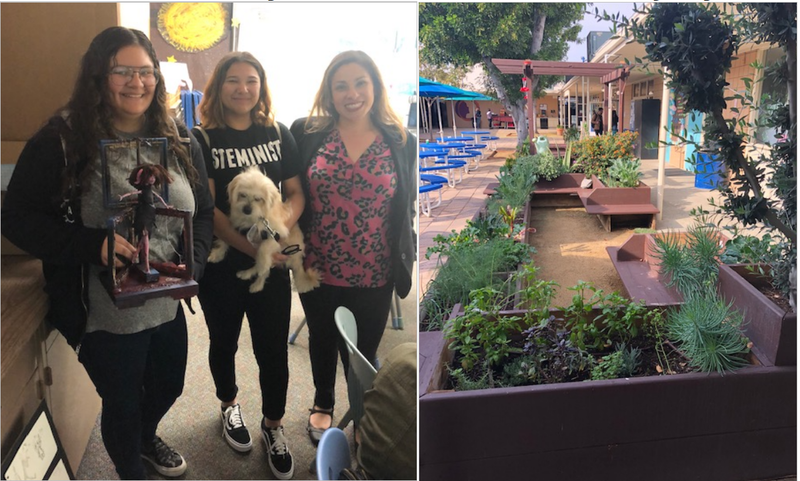 The next student, Jessica Castellanos wearing the STEMINIST T-shirt has been involved in animal care for a very long time and is also working in the fields of science and technology with her doggie. The two exhibitions I attended were framed in rather unique ways. They weren’t about internships although they had internships and they weren’t about careers although both young woman were on a trajectory to professional careers. Quite unintentionally, the exhibitions were framed around understanding who they are through their interests. The first student I saw was Catherine Ramirez, a senior. She presented problems she saw around how her curly hair was creating issues for her in becoming a professional and how to resolve these issues through her research in math, science, history, writing, communication and social justice This was one of these incredible exhibitions that brought everything together across disciplines around who she was and the dilemmas she faces focusing on her development of a positive self-image and being perceived as a professional. Her presentation was beyond the pale. The next exhibition I went to was from Jimena Sanchez, a 9th grader who likes to solve mysteries and care for people. What she figured out was that pathology was a field that would hold her interest around these personal traits so, she is pursuing becoming a pathologist. Why I love these two presentations so much was that even though these pursuits of interests weren’t about having an internship and weren’t about a career, the students were allowed to follow their interests with their advisors and the adults in and outside the school encouraging, facilitating, guiding and teaching. This work is what we are about. Young people figuring out how to work through who they are and how to fit in a world where acceptance is not a given. Next stop for me, was going up to San Francisco where I spent the day with Alt School staff, students, tech and curriculum people. I had a great time especially when I talked with students about their interests outside of school and doing a fireside chat with Kelsey Payne at the end of the day. From the response of staff, it seemed like my time there brought us all closer together around the development of the Alt School and ImBlaze platforms that put students in a bigger role of driving what they want to learn and then having adults follow along with them. In the coming weeks, there’s more to do around our discussions to put them into practice.